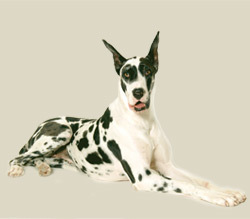 The Great Dane is a giant dog that combines nobility with robustness and power with elegance. It has a long narrow head with an accentuated frontal stop and a rather large nasal canal. Its neck is long and muscular and its front legs are perfectly straight. It has muscular thighs and round feet with short, dark nails. The Great Dane"s tail is medium-length, reaching to the point of the hock. Its eyes are round and usually dark - with a lively intelligent expression. Its ears are either cropped rather long, pointed, and carried erect, or left natural. Its well developed white teeth must close in a scissors bite. All Danes have short, thick, shiny, close-fitting hair. The color of the coat indicates the variety, fawn, brindle, black, blue, mantle harlequin and sometimes merle. Although not a recognized color, chocolate does occur in a recessive gene. Merle is a common result of harlequin breeding, but it is not a recognized color. Black coats and dark eyes, while blue Danes may have lighter eyes.